Ingvar Feodor Kamprad was born on 30 March 1926, in a small farm called Elmtaryd near village of Agunnaryd, in the Swedish province of Småland. Kamprad started showing interest in business even as a small boy.Hebegan to develop a business as a young boy, selling matches to neighbours from his bicycle. He found that he could buy matches in bulk very cheaply from Stockholm, sell them individually at a low price, and still make a good profit. Ingvar Kamprad began his career at the age of five. He asked his aunt when she visited the Swedish capital Stockholm if she could buy 100 boxes of matches for 0.88 SEK a piece and bring them back to Ingvar Kamprad. He later sold these matches for a profit of 0.01 to 0.05 SEK a piece. Ingvar Kamprad also sold Christmas cards, fish he had caught himself and berries he had collected himself.He reinvested his profits and expanded to fish, seeds, Christmas tree decorations, and pens and pencils. Because he was always reluctant to wake up early in the morning and help his father milk the cows, Kamprad’s parents worried their son would not amount to much. His father would say. “You’ll never make anything of yourself!” However, that all changed when Kamprad received an alarm clock for his birthday. Kamprad began setting the alarm for 5:50 am every day, and removed the ‘off’ button. This was a major turning point in the young Kamprad’s life; he began to focus on achievement rather than sleep. His amazement that he could buy a product and resell it for a profit fuelled his ambitions as a young boy to become a successful businessman. Although he suffered from Dyslexia, this did not hamper his desires and aspirations to succeed. He is a totally self made businessman who learnt all the tricks by his hard work and made the best use of all opportunities in his career.He continued to expand his business to a variety of goods, including wallets, watches, jewellery and stockings. When he outgrew his ability to call on his customers individually, he converted to a sort of makeshift mail order operation, hiring the local milk van to make his deliveries. At the beginning of its operation, the young Kamprad engaged in the trade of different things (from matches to discount stockings). But the biggest demand was for pen. At the beginning of 1940s they were a novelty even in Sweden. Kamprad ordered 500 pens from Paris, taking a loan of 500 SEK in a district bank (at the time around 63 USD). According to Kamprad, this was the first and the last loan that he had taken in his life. At first the business was typically mail-order and included only small household goods such as picture frames, wallets, nylon stockings, pens and wallets. 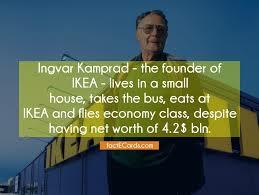 Five years later he expanded to include furniture.In 1947, Kamprad introduced furniture into the IKEA product line. At 17, in 1943, Kamprad’s father rewarded him with a small sum of money for doing well in school, despite being dyslexic. 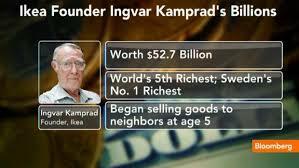 With it, Ingvar founded a business named IKEA.The name IKEA was formed from Kamprad’s initials (I.K.) plus the first letters of Elmtaryd and Agunnaryd, the farm and village where he grew up. In 1948, Ingvar Kamprad came up with a fresh idea and he decided to engage in trade of furniture. Further it will be the main source of profit for IKEA.The furniture was delivered in trucks to homes as well as train stations. Despite his dyslexia problem the company flourished. As with all good ideas the Ikea concept is simple: pass the job of putting furniture together on to the customer. The idea came to Kamprad when he took the legs off a table to make it fit into a car. He once said “Guimars Fabriker from Alvesta, who was my main competitor, has been selling furniture in Kagnuit for a long time. I saw his ad in an agricultural newspaper and also decided to try my hand in the business. Thus, furniture sale, which I started by chance, and solely in order to outdo my competitors, has determined my fate”. The use of local manufacturers allowed him to keep his costs down. The furniture was a hit, and in 1951, Kamprad decided to discontinue all other product lines and focus on furniture. In 1953, the first IKEA showroom opened. It came about because of competitive pressures. IKEA was in a price war with its main competitor. The showroom allowed people to see it, touch it, feel it, and be sure of the quality before buying. On the one hand, Kamprad has a reputation for being, “cheap”. He takes the subway to work, and when he drives, it’s an old Volvo. He always travels economy class in planes, and if he goes by train, if possible, he will sit in second class. He never stays at expensive hotels. Though past 85, Kamprad still travels the world to visit new IKEA stores. He flies economy class, calls his employees ‘co-workers’, encourages everyone to dress informally, stays in cheap hotels and even replaces bottles from the hotel room mini-bar with cheap bottles bought in local supermarkets. He gives no interviews. He reportedly recycles tea bags and is known to pocket the salt and pepper packets at restaurants.” In addition, Kamprad has been known to visit IKEA for a “cheap meal”. He is known for purchasing Christmas paper and presents in post-Christmas sales. Kamprad’s biographers believe that the trading hobby was passed to Ingvar by inheritance. In 1897, the company, that belonged to the grand father of the future billionaire was on the verge of bankruptcy. His grandfather could not pay the mortgage and committed suicide. But the Ingvar’s grand mother was able to save the business. So she taught her grandson to bridge over the difficulties with will power and perseverance. Ingvar’s grand mother Francis had a huge positive impact not only on him, but on the entire family. She was a very intelligent woman from a simple origin. People, who closely work with Ingvar Kamprad, say that he is a brilliant marketer, wise man who never makes a mistake. He tells people he has many shortcomings, that he is slightly stupid. Yet he remains incredibly sharp and knowledgeable down to the smallest detail. To attract prospective customers to the presentation of the store, the young entrepreneur promised a free cup of coffee and a bun to everyone who would come. Imagine his surprise when this modest event attracted more than a thousand people! The first presentation of the day was about to become the last one. Nevertheless, everyone got a cup of coffee and a bun. And the idea about opening a fast food restaurant in each store looked great for the owner of IKEA. Time passed and each IKEA store got a fast food restaurant. From modest beginnings with local mail order Ikea now serves 350 million customers. View the following video to know about his success story. “Making mistakes is the privilege of the active. It is always the mediocre people who are negative, who spend their time proving that they were not wrong”.